Nite Of Stars Event Website Hot Off the Press! Posted by Blue on Sep 6, 2017 in News | Comments Off on Nite Of Stars Event Website Hot Off the Press! 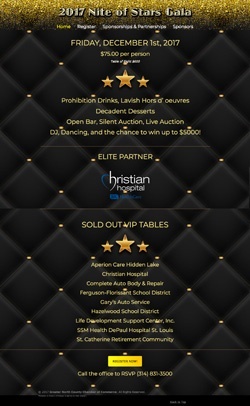 Home » News » Nite Of Stars Event Website Hot Off the Press! Check out this newest Blue’s ArtHouse website we just created for the North County Chamber of Commerce’s annual Nite of Stars event! This year’s theme is the roaring 20s and we incorporated a delightfully decadent glittery design to fit the occasion. This is a basic event site with just a few pages and links back to the Chamber site for registration and more information. Websites like this are quick and affordable and really help market events successfully. Do you have an event coming up that you’d like to promote? Talk to us about an event website. If you are already a Blue’s ArtHouse customer, your regular maintenance service may even cover the development of a site like this with no extra charges!